On April 1st, CAMERA’s Christian Media Analyst Dexter Van Zile posted on an Irish Times article (‘State of Palestine ‘not only matter of justice but of leading normal life’, Feb. 15) which claimed that international students can’t attend Bethlehem University because of Israeli visa restrictions. “The situation is really difficult,” she said. Israeli visa restrictions mean international students cannot attend the university, cutting off one likely stream of revenue. Only three-month tourist visas were available to such students. However, as Van Zile noted in his CAMERA post, the claim that Israeli policy makes it impossible for international students to attend Bethlehem University seemed inaccurate. Van Zile cited information about international students on Bethlehem University’s website, as well as an email exchange he had with a representative of the university confirming that such students can indeed enroll. Shortly after the post, we followed up with editors at the Irish Times asking them correct the false claim. Though several of our emails to editors at the foreign desk went unanswered, we eventually received a reply from the managing editor who confirmed that he passed along our complaint to the paper’s readers’ editor. 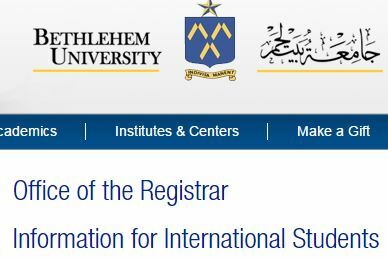 After several more weeks, and follow-up research on the story by the Irish Times, the readers’ editor confirmed that our concerns were valid, and that they’d be revising the article to note that, despite Israeli visa restrictions, international students can indeed attend Bethlehem University. We thank the Irish Times readers’ editor for agreeing to the correction. So Israeli visa restrictions don’t exclude international students, they just discourage them from applying by requiring three month tourist visas when students would normally want at least 12 month access to the country. The thrust of the original report remains valid. By calling for a petty correction you just draw attention to the vindictive nature of Israeli treatment of Palestinian institutions. How exactly are they discouraged from applying for visas sencar? Furthemore, where is it stated that 12-month visas are denied? The thrust of your post remains clear. By looking for angles to demonize Israel you just draw attention to the vindictive nature of your anti-Israel agenda.